You could call this an intelligent guess. I don't have much knowledge of the markets but from what I have been reading about in the past couple of months and as the way the markets were behaving it was just too obvious that the next breakout would have started in April. See to begin with let's first look at the charts last year and the year before. Statistically the two major indices in this country have grown post 1st quarter results. Hence one thing was that pretty clear to me was that the markets would follow a similar pattern like the previous years. 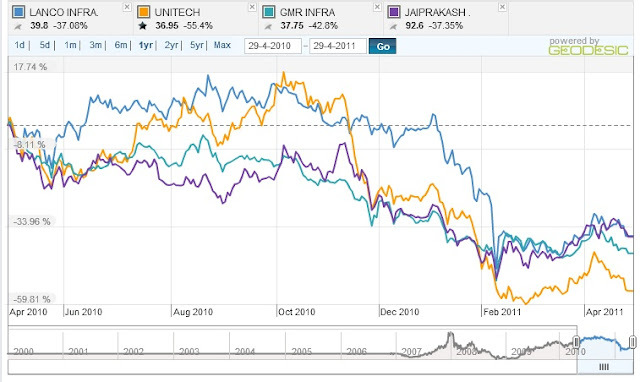 Moreover, the rally that the Indian Markets had seen throughout the year had somewhat stalled in the 1st quarter of 2010. It was evident that the markets were oversold but it was still maintaining this range-bound cautious approach. A Bull market had suddenly turned into a bears paradise. My friend an colleague Soumya Bhattacharya who is also a guest blogger here was apprehensive on the market in mid Jan and early Feb. Being a bear his fear was that Union Government would pull out most of the leverages it had extended in the last two years from the financial system and the markets would respond with downward movement. Well he was mostly correct with his forecast of the 1st quarter. I was however fairly sure that April would see the beginning the upward rally. Now another thing that could have triggered the sudden rally is that most of the companies didn't show good results in the end quarter of 2009. Also both YOY & QOQ results for most companies would look way better than that of last April and December. We saw heavy upward movement in the past two trading sessions. I can already see a few of the companies that I have been tracking have crossed or atleast reached their 52 Week highs. Infact now that Nifty has broken 5300 I think we should look at 5500 on the Nifty in the next few months. I think one should look at partly booking profits this earning season and partly hold till the end of the third quarter.